Additive Manufacturing: Materials, Processes, Quantifications and Applications is designed to explain the engineering aspects and physical principles of available AM technologies and their most relevant applications. It begins with a review of the recent developments in this technology and then progresses to a discussion of the criteria needed to successfully select an AM technology for the embodiment of a particular design, discussing material compatibility, interfaces issues and strength requirements. The book concludes with a review of the applications in various industries, including bio, energy, aerospace and electronics. This book will be a must read for those interested in a practical, comprehensive introduction to additive manufacturing, an area with tremendous potential for producing high-value, complex, individually customized parts. As 3D printing technology advances, both in hardware and software, together with reduced materials cost and complexity of creating 3D printed items, these applications are quickly expanding into the mass market. Jing Zhang is an associate professor of mechanical and energy engineering at Indiana University - Purdue University Indianapolis, USA. His recent research interests include (1) developing new extrusion based novel AM processes for metallic and ceramic materials, (2) understanding the process-property-performance relationship in AM components, and (3) developing multi-scale multi-physics AM process models. 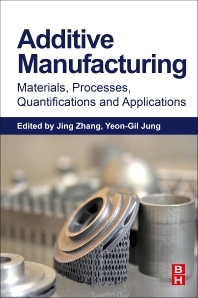 Dr. Zhang is the editor-in-chief of International Journal of Additive Manufacturing (Taylor & Francis Group). He is also the co-chair of the AMSC Post-Processing Working Group, formed by America Makes & ANSI Additive Manufacturing Standardization Collaborative (AMSC). For the past several years he has served as a lead organizer of several symposia on additive manufacturing for both ASM and TMS. Dr. Yeon-Gil Jung is an professor of School of Materials Science and Engineering at Changwon National University, Republic of Korea. He also serves as the Vice President of the Korean Ceramic Society. He received his B.S, M.S, and Ph.D. degrees from Hanyang University, Republic of Korea. After that, he studied material property evaluation using Hertzian Indentation at NIST (National Institute Standard and Technology) with Dr. Brian Lawn during 1997-1999. He joined Changwon National University in 1999. He has been a visiting scholar and research professor 2013 - 2017 at Indiana University - Purdue University Indianapolis.